The beginning of World War II had a major impact on both the swing and rhythm clubs. By the early 1940s nearly all clubs had ceased due to the dramatic decrease in membership as many of their members enlisted or were conscripted into the armed forces, auxiliary services, or were engaged in other war work. 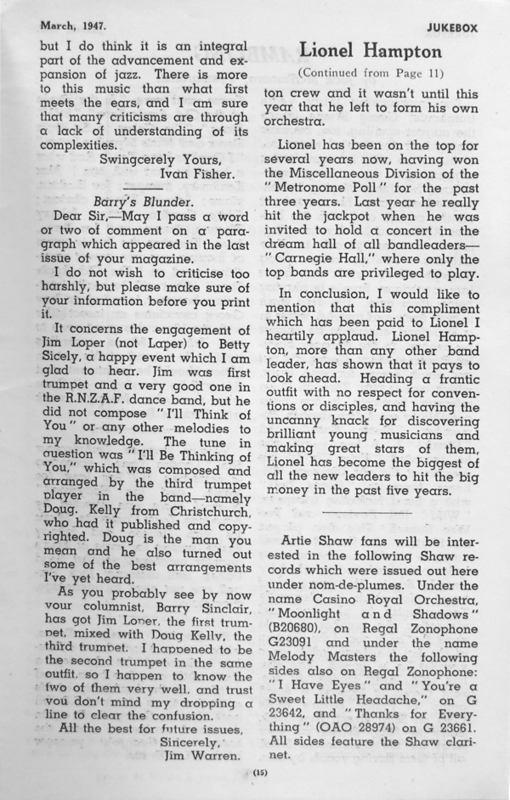 The war years, like those of the Depression, were very quiet for fan organisations, and it would not be until mid-1945 that jazz clubs began to reappear in New Zealand. After the end of World War II jazz clubs began to re-emerge in all the main centres of New Zealand. However, this time the clubs that focused on dancing did not reappear as they had in the late 1930s, and what we think of as modern jazz fan activities began to take shape. The jazz clubs were primarily focused on listening and were now termed “swing clubs”. The swing clubs closely resembled the rhythm clubs of the late 1930s. In terms of membership demographics (young adults for the most part, but not excluding older adolescents and people in their middle years), format and structure, they were almost identical. The post-war clubs were a mixture of musicians and serious jazz fans, from all backgrounds, and all ages from teenagers to men and women in their fifties and older. The only quality needed was a passion for listening to and learning about jazz. While there were usually more men than women involved (as was the case in the pre-war rhythm clubs), women were welcomed and included, and a number served on the organising committees. 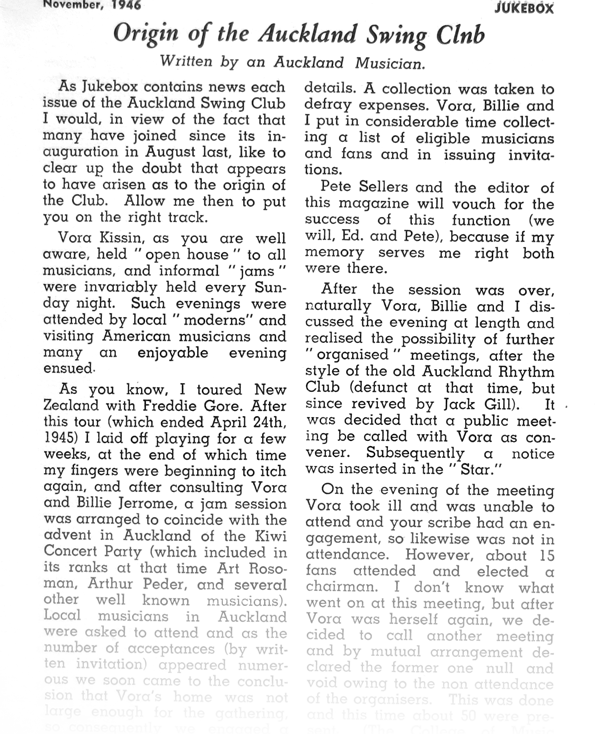 Some, like Auckland pianist Vora Kissin, had been instrumental in the formation of both the late 1930s rhythm clubs and the post-war swing clubs. The main difference appears to have been that the mid-1940s version of the jazz club included more local bands, jam sessions (both informal and formal), and more promotion and advocacy of local jazz. 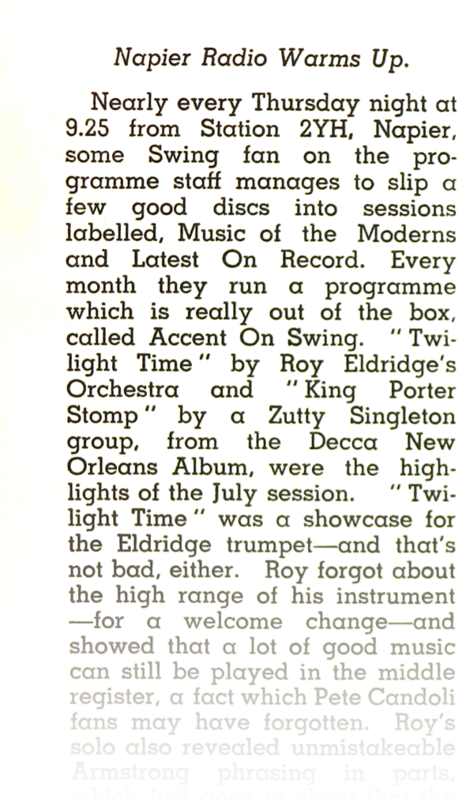 The central aim of these clubs according to Jukebox: New Zealand’s Swing Magazine was "the furtherance and appreciation of swing music" in New Zealand society. 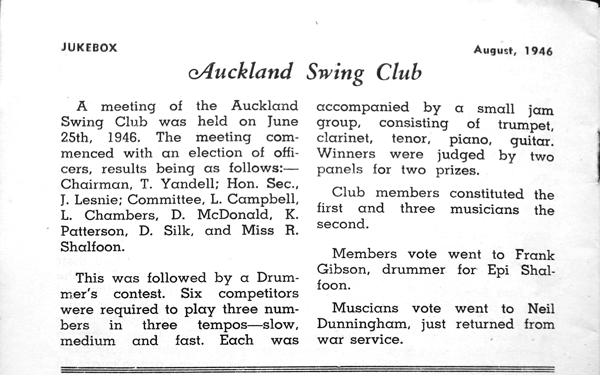 By the end of 1946 all of the main cities had at least one swing club (Auckland had three, including one dedicated to Artie Shaw), and so did many of the smaller towns, such as Hamilton and Nelson). Nor were the membership lists small. The Auckland Swing Club (the biggest of the three swing/jazz clubs in Auckland), which had been established in August 1945, had a membership of 550 people by June 1946. 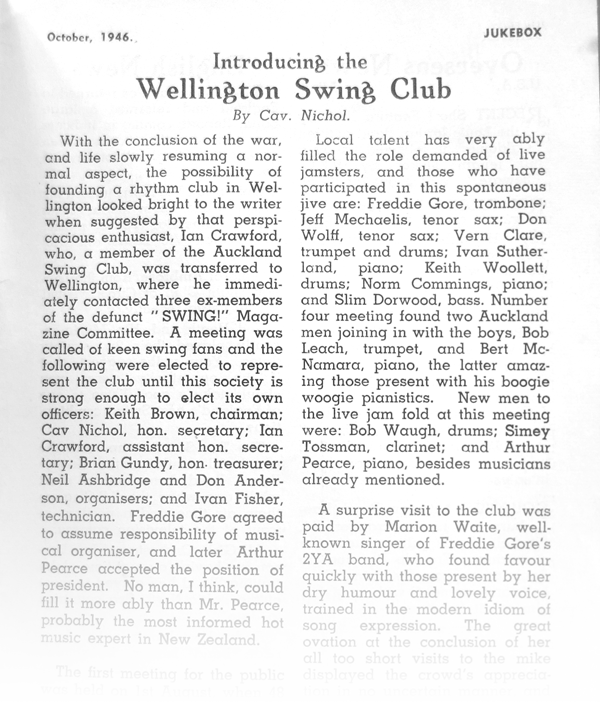 Wellington Swing Club, established in August 1946 had, by the publication of the October 1946 issue of Jukebox magazine, a membership of 113 people. Even clubs in smaller towns such as Invercargill and Hamilton had memberships of between 50 and 80 people. That there were large numbers joining the various jazz clubs indicates that swing was a fashionable pastime. The club evenings offered a chance for members to explain and share with their fellow fans different aspects of jazz that they were particularly attracted to. The format and structure of club meetings and events varied somewhat from club to club, but they all included some commonalities. There were presentations by members of recordings, with analyses of the composition and/or the solos, short talks on a jazz related topic, games and quizzes with prizes of the latest swing records, and, of course, the live performance of jazz by local musicians. One aspect that was central to the swing club fan activities was the advocacy of the local jazz scene. This was quite a departure from the pre-war clubs whose focus was primarily on jazz produced overseas, particularly America, and supporting the local jazz scene was a by-product of their activities, such as dances. The advocacy of local jazz via the swing clubs took several forms. Local and visiting musicians/bands were regularly invited to perform at the meetings, both formally and informally, separate from the end-of-meeting jam sessions. Invitations to perform were also regularly given to the young up-and-coming musicians, which was an important part of fostering the continuance of the jazz scene. 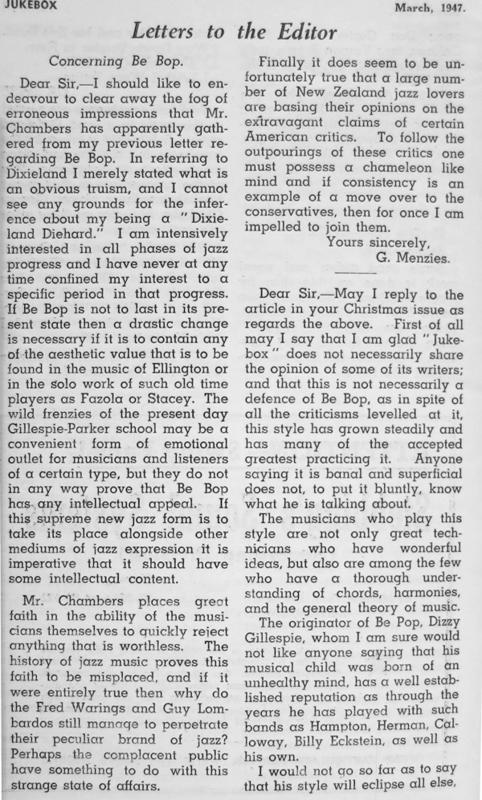 This gave musicians a chance to, essentially, show-off in ways that they could not on gigs (since the primary gig for jazz musicians remained the cabaret and dance hall circuits), or on the radio, where extended solos or trading were limited by the format required by either situation. It was also a way for musicians to show fans exactly what they were capable of, and how they could, potentially, match their favourite famous musicians. Another form of advocacy was the jam session, both as a regular part of club meetings and outside of the club. The jam sessions in the club meetings were a common way to end the meeting with any musician members, as well as invited guests, taking the stage for anywhere from half an hour to two or three hours (depending on the location, the club, the audience and the musicians). The jam sessions at club meetings were occasionally themed, such as a Dixieland style jam session, but usually the jam sessions were a mix of audience and musician requests. Jam sessions were also organised by individuals outside of club meetings. Jam sessions held outside of the club-meeting format were also important. Privately organised jam sessions were usually hosted by a club member in their home, or occasionally the organiser would hire a hall or other larger venue. These jam sessions were entire evenings devoted to the interaction between musicians and fans. This latter type of session was very important to the development of the jazz fan community, and this variation of jam session is detailed in the article Official Jam Sessions. Both types of jam sessions can be viewed as forms of advocacy as they promoted awareness among fans about the heretofore-private rituals of musicians. Participation by younger musicians advocated their skills and potential to older musicians and bandleaders, and to the fans. In addition to the jam session, clubs hosted activities that were open to the general public, such as record recitals and dances, to promote jazz in general, and local jazz in particular. 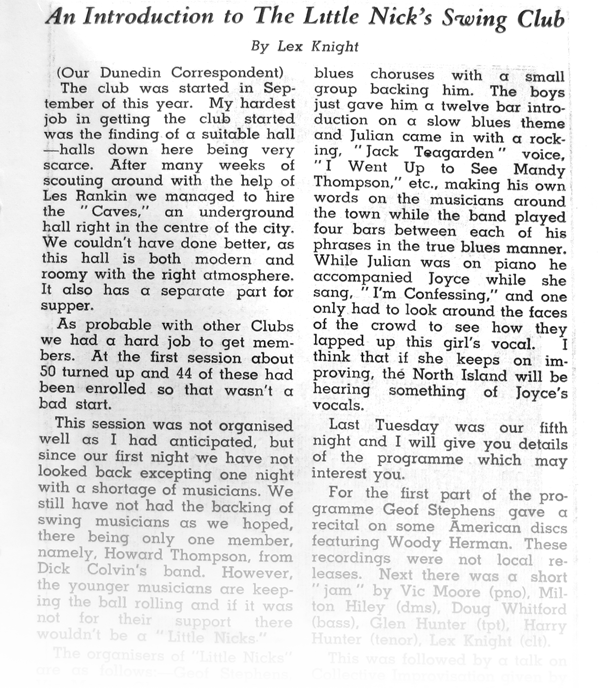 Clubs and fan publications such as Jukebox also ran local popularity polls, in the style of the polls run by American jazz magazine Downbeat, with the club polls open to the general public rather than just club members. 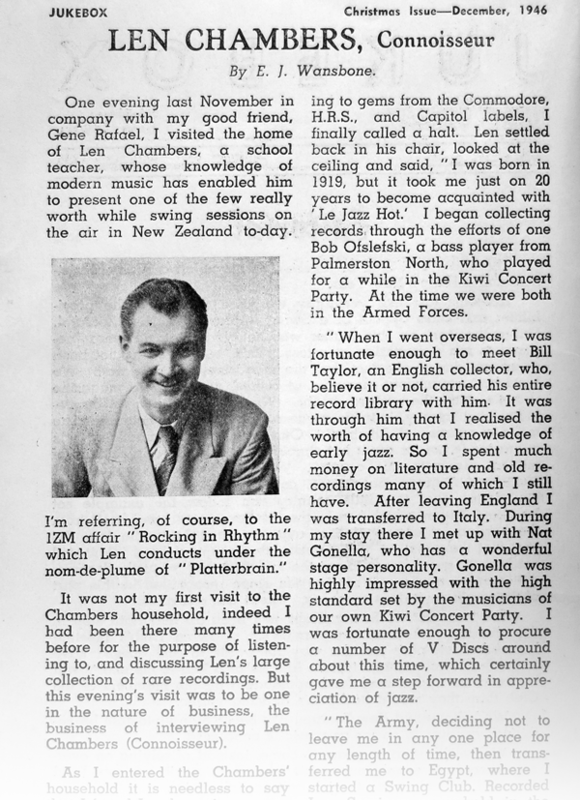 These and other activities helped place swing clubs as advocates of not just swing but all styles of jazz in the New Zealand jazz community. The clubs promoted and supported established and up and coming jazz musicians through their activities. They also provided a forum for fan–fan, fan–musician, and even musician–musician interaction, and for debates about all aspects of jazz for both fans and musicians, often across the fan–musician divide.